The VC5090 combines rugged construction and high performance wireless networking to enable real-time data access and collection in the harshest environments — from the loading dock and freezer to the warehouse floor. Whether your workers are on a forklift, at a fixed station or moving through the warehouse aisles, the VC5090 provides the tools needed to increase productivity and reduce errors in shipping and receiving, as well as put-away and picking applications. The results are improved decision making, streamlining of warehouse operations — and a positive impact on your bottom line. 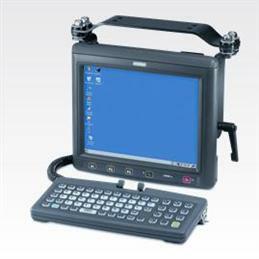 Easily leverage applications developed for other Symbol rugged mobile computers with Intel XScale® PXA270 @ 624 MHz and Windows CE 5.0 Professional, offering support for a wide range of applications, real-time processing and data storage needs. Designed to withstand the most extreme environments, IP66-sealed aluminium housing and MIL-STD-810F military rating protect your investment and dramatically reduce downtime and repair costs. Contract extends normal wear and tear to cover accidental damage to displays, touch screens and internal components; reduces repair costs. Reliable operation in freezer/cold store/outdoor environments as low as -22° F/-30° C.
Easy and cost-effective centralised remote management. Ensures robust wireless connectivity, even in challenging environments. Support for wireless printing and cordless scanning.